BOB ART IS ON SALE FOR THE REST OF THE YEAR!!!! Simply scroll to the panel you want on squirrelosophy.com. If there’s a “OWN THIS SQUIRREL” button underneath the panel, it’s available for purchase. If not, then… I think you get the idea. Also check THE ARCHIVE page… for a rundown of past panels. SALE IS GOOD THRU THE END OF 2018. 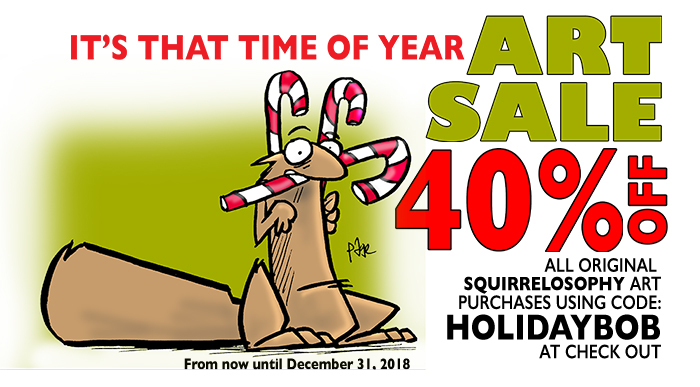 Now is the time to acquire that squirrel art you’ve been admiring!